A device (100) comprising a light source (101-106), a sample holder (107) and temperature control chamber (317). The sample holder (107) supports the vessels (109) in a fixed relationship relative to the light source (101-106). The temperature control chamber (317) surrounds the sample holder (107) and vessels (109) so that a temperature control fluid (317) may be passed around the sample vessels (109) effectively maintaining the temperature of the saample vessels (109) with a desired temperature range. The present invention relates to a device and method for irradiating, and in particular, for photoactivating compounds. Irradiation devices are designed around the spectroscopic requirements of the photoactivator and the specialized needs of the particular application of the photoactivator. There are two broad categories of photoactivator applications. First, irradiation devices are used An vivo to treat disease or for whole body irradiation of animals in research studies. Second, irradiation devices are used in vitro to treat chemical mixtures or for other purposes. (T.B. Fitzpatrick, Ed.) (Univ. of Tokyo Press 1974) pp.559-568. One important clinical application of photoactivation devices involves the use of psoralens to treat psoriasis and certain leuke ias. The photochemical and photobiological properties of psoralens and isopsoralens are characterized in U.S. Patents Nos. 4,599,303 and 4,312,883 which are hereby incorporated by reference. Psoralens are tricyclic compounds formed by the linear fusion of a furan ring with a coumarin. Psoralens can intercalate between the base pairs of double-stranded nucleic acids, forming covalent adducts to pyrimidine bases upon absorption of longwave ultraviolet light. G. D. Cimino et al.. Ann. Rev. Biochem. 54:1151 (1985). If there is a second pyrimidine adjacent to a psoralen- pyri idine monoadduct and on the opposite strand, absorption of a second photon can lead to formation of a diadduct which functions as an interstrand crosslink. Isopsoralens, like psoralens, are tricyclic compounds formed by the fusion of a furan ring with a coumarin. See Baccichetti et al. , U.S. Patent No. 4,312,883. Unlike psoralens, the rings of isopsoralen are not linear. While able to intercalate between the base pairs of double-stranded nucleic acids and form covalent adducts to nucleic acid bases upon absorption of longwave ultraviolet light, isopsoralens, due to their angular geometry, normally cannot form crosslinks with DNA. See generally, G. D. Cimino et al.. Ann. Rev. Biochem. 54:1151 (1985). (1977); Shen et al., J. Mol. Biol. 116, (1977); Shen and Hearst, Nucleic Acids Research 5, 1429 (1978) ; Shen et al. , J. Mol. Biol. 127, 163 (1979); Thammana and Cantor, J. Mol. Biol. 135, 271 (1979); Welsh and Cantor, J. Mol. Biol. 198, 63 (1987); Wollenzien et al. f Proc. Natl. Acad. Sci. 75, 1642 (1978); Wollenzien and Hearst, J. Mol. Biol. 135, 255 (1979) ; Haas efe al., J. Mol. Biol. 159, 71 (1982); Schwartz et al.. Cold Spring Harbor Symp. Quant. Biol., Vol. XLVII, p.189 (1983). Other devices have been developed by other photochemistry groups. See for example Dall'Acqua et al. , National Cancer Inst cute Monograph 66, 55 (1984) [HPW Philips lamps]. There are a variety of irradiation devices that are commercially available for research purposes. For example, Rayonet Chamber Reactors are available from The Southern New England Ultraviolet Co. (Ha den, CT., USA). The STRATALINKER UV Crosslin er is avaiable from Stratagene (La Jolla, California USA) . BIOSLINK transi_.iuminators are available from BIOS Corp. (New Haven, CT, USA) . Whole body irradiators are available from Vilber Lourmat (France) . Transilluminators and hand-held UV lamps are available from UVP (San Gabriel, California USA) and Spectronics Corp. (Westbury, NY, USA) . Solar Similators are available from Oriel Corp. The present invention contemplates devices and methods for irradiation and specifically, for activation of photoreactive compounds. The present invention contemplates devices having an inexpensive source of electromagnetic radiation that is integrated into a unit. In general, the present invention contemplates a device comprising: a) means for providing appropriate wavelengths of electromagnetic radiation; b) means for supporting a plurality of sample vessels in a fixed relationship with the radiation providing means during irradiation; and c) means for maintaining the temperature of the sample vessels within a desired temperature range during irradiation. The present invention also contemplates methods for photoactivating, comprising: a) supporting a plurality of sample vessels, containing one or more photoreactive compounds, in a fixed relationship with a fluorescent source of electromagnetic radiation; b) irradiating the plurality of sample vessels simultaneously with the electromagnetic radiation to cause activation of at least one photoreactive compound; and c) maintaining the temperature of the sample vessels within a desired temperature range during activation. In one embodiment, the present invention contemplates a device, comprising: a) means for providing electromagnetic radiation; b) means for supporting a plurality of sample vessels in a fixed relationship with the radiation providing means during irradiation; c) an opaque housing for containing the radiation providing means; and d) means for maintaining the temperature of the sample vessels within a desired temperature range during the irradiation comprising a chamber positioned interior to the housing and in a fixed relationship to the radiation providing means. The present invention also contemplates a device, comprising: a) means for providing electromagnetic radiation, having a wavelength cutoff at 300 nanometers; b) means for supporting a plurality of sample vessels in a fixed relationship with said radiation providing means during irradiation; and c) means for maintaining the temperature of said sample vessels within a desired temperature range during said irradiation, comprising a chamber positioned in a fixed relationship to said radiation providing means. The present invention also contemplates a device, comprising: a) a fluorescent source of ultraviolet radiation; b) means for supporting a plurality of sample vessels in a fixed relationship with said fluorescent radiation source during irradiation; and c) means for maintaining the temperature of said sample vessels within a desired temperature range during said irradiation, comprising a chamber positioned in fixed relationship to said fluorescent radiation source. The present invention also contemplates a device, comprising: a) a fluorescent source of ultraviolet radiation; b) means for supporting a plurality of sample vessels, said sample supporting means positioned with respect to said fluorescent source, so that, when measured for the wavelengths between 300 and 400 nanometers, an intensity flux greater than 15 W cm"2 is provided to said sample vessels during irradiation with said fluorescent source; c) an opaque housing for containing said radiation providing means; and d) means for maintaining the temperature of said sample vessels within a desired temperature range during said activation, comprising a chamber positioned interior to said housing and in a fixed relationship to said fluorescent radiation source. The present invention also contemplates a photoactivation device for treating photoreactive compounds, comprising: a) means for continuously flowing sample liquid containing photoreactive compound; b) means for providing appropriate wavelengths of electromagnetic radiation in a fixed relationship with said continuous flowing means to cause activation of at least one photoreactive compound; and c) means for maintaining the temperature of said continuously flowing sample liquid within a desired temperature range during said activation. In some embodiments the sample vessel supporting means comprises intrusions in the chamber. In other embodiments, the chamber has exterior and interior walls. In still other embodiments, the interior walls of the chamber form a trough. The sample vessel supporting means in such an embodiment comprises a sample rack detachably coupled to the housing above the trough. Such an embodiment further comprises a sample cover dimensioned to overlay said sample rack. In general, the chamber has inlet and outlet ports so that temperature control liquid may enter and exit. The present invention also contemplates a method for photoactivating photoreactive compounds, comprising: a) supporting a plurality of sample vessels, containing one or more photoreactive compounds, in a fixed relationship with a fluorescent source of electromagnetic radiation; b) irradiating said plurality of sample vessels simultaneously with said electromagnetic radiation to cause activation of at least one photoreactive compound; and c) maintaining the temperature of said sample vessels within a desired temperature range during said activation. Figure 1 is a perspective view of one embodiment (CE-I) of a photoactivation device of the present invention. Figure 2 is a cross-sectional view of CE-I along lines a—a of Figure 1. Figure 3 is a cross-sectional view of CE-I along lines b—b of Figure 2. Figure 4 is a perspective view of an alternative embodiment (CE-II) of a photoactivation device of the present invention. Figure 5 is a cross-sectional view of CE-II along lines c—c of Figure 4. Figure 6 is a perspective view of yet another alternative embodiment (CE-III) of a photoactivation device of the present invention. Figure 7 is a cross-sectional view of CE-III along lines d—d of Figure 6. Figure 8 is a cross-sectional view of CE-III along lines e—e of Figure 6. Figure 9 is a perspective view of a removable sample tray for sample size processing adjustment of CE-III. 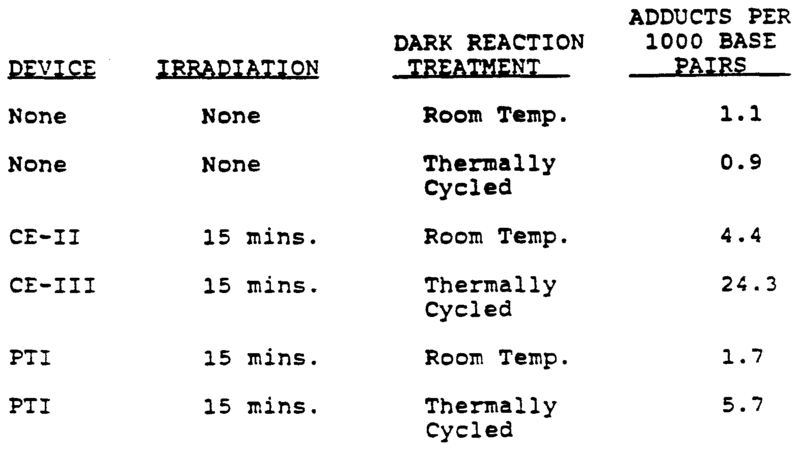 Figure 10 shows the impact of irradiation time on temperature of the sample in the devices of the present invention. Figure 11 shows the relative energy output of the devices of the present invention. Figure 12 is a flow chart schematically showing a manner in which covalent binding was measured. Figure 13 shows covalent binding according to photoactivation device used. Figure 14 shows the intensity of the light of the devices of the present invention according to sample position. Figure 15 shows covalent binding according to sample position in the devices of the present invention. Figure 16 is a flow chart schematically showing a manner in which production of photoproduct was measured. Figure 17 shows the production of photoproduct over time. Figure 18 show production of photoproduct according to the photoactivation device used. DESCRIPTION OF THE INVENTION The present invention contemplates devices and methods for irradiation and specifically, for activation of photoreactive compounds. The present invention contemplates devices having an inexpensive source of electromagnetic radiation that is integrated into a unit. In general, the present invention contemplates a device comprising: a) means for providing appropriate wavelengths of electromagnet- radiation; b) means for supporting a plurality of sample vessels in a fixed relationship with the radiation providing means during irradiation; and c) means for maintaining the temperature of the sample vessels within a desired temperature range during irradiation. The present invention also contemplates methods for photoactivating, comprising: a) supporting a plurality of sample vessels, containing one or more photoreactive compounds, in a fixed relationship with a fluorescent source of electromagnetic radiation; b) irradiating the plurality of sample vessels simultaneously with said electromagnetic radiation to cause activation of at least one photoreactive compound; and c) maintaining the temperature of the sample vessels within a desired temperature range during activation. The major features of one embodiment of the device of the present invention involve: A) an inexpensive source of ultraviolet radiation in a fixed relationship with the means for supporting the sample vessels, B) rapid photoactivation, C) large sample processing, D) temperature control of the irradiated samples, and E) inherent safety. A. Electromagnetic Radiation Source A preferred photoactivation device of the present invention has an inexpensive source of ultraviolet radiation in a fixed relationship with the means for supporting the sample vessels. Ultraviolet radiation is a form of energy that occupies a portion of the electromagnetic radiation spectrum (the electromagnetic radiation spectrum ranges from cosmic rays to radio waves) . Ultraviolet radiation can come from many natural and artificial sources. Depending on the source of ultraviolet radiation, it may be accompanied by other (non- ultraviolet) types of electromagnetic radiation (e.g. visible light) . Particular types of ultraviolet radiation are herein described in terms of wavelength. Wavelength is herein described in terms of nanometers ("nm"; 10"9 meters) . For purposes herein, ultraviolet radiation extends from approximately 180 nm to 400 nm. When a radiation source does not emit radiation below a particular wavelength (e.g. 300 nm) , it is said to have a "cutoff" at that wavelength (e.g. "a wavelength cutoff at 300 nanometers") . When ultraviolet radiation is herein described in terms of irradiance, it is expressed in terms of intensity flux (milliwatts per square centimeter or "mW cm"2 ) . "Output" is herein defined to encompass both the emission of radiation (yes or no; on or off) as well as the level of irradiance. B. Rapid Photoactivation The light source of the preferred embodiment of the present invention allows for rapid photoactiv¬ ation. The intensity characteristics of the irradiation device have been selected to be convenient with the anticipation that many sets of multiple samples may need to be processed. With this anticipation, a fifteen minute exposure time is a practical goal for most applications. A fifteen minute exposure, in addition to its convenience, provides for reproducible results. In this regard, it should be noted that the binding levels of photoactive compounds to polynucleotides increases with increasing exposure to activating light. A plateau of binding density is ultimately achieved. This plateau results from competing photochemical reactions. Most photoreactive compounds which undergo addition reactions to the base moieties of nucleic acid also undergo photodecomposition reactions when free in solution. For a given intensity flux (watts/cm2) the relative rates of these competing reactions will determine when, in the course of a time course of an irradiation process, the plateau level will be achieved. For reproducible binding, it is desirable to have irradiation protocols that result in plateau levels of binding. Plateau levels of binding will avoid minor intensity differences that can arise from small differences in sample position (i.e. while the means for supporting the sample vessels can be in a fixed relationship with the source of irradiation, each sample in a large number of samples cannot occupy precisely the same point in space relative to the source) . When plateau binding is used, identical reaction mixtures in different positions will show the same level of binding. In designing the devices of the present invention, relative position of the elements of the preferred device have been optimized to allow for plateau binding in fifteen minutes of irradiation time through Eppendorph tubes for most photoreactive compounds thus far tested. The present invention contemplates for a preferred device: a) a fluorescent source of ultraviolet radiation, and b) a means for supporting a plurality of sample vessels, positioned with respect to the fluorescent source, so that, when measured for the wavelengths between 300 and 400 nanometers, an intensity flux greater than 15 mW cm"2 is provided to the sample vessels. Similarly, in the preferred method the present invention, the following steps are contemplated: a) providing a fluorescent source of ultraviolet radiation, and b) supporting a plurality of sample vessels with respect to the fluorescent source of ultraviolet radiation, so that, when measured for the wavelengths between 300 and 400 nanometers, an intensity flux greater than 15 mW cm"2 is provided simultaneously to the plurality of sample vessels, and c) simultaneously irradiating the plurality of sample vessels. C. Processing of Large Numbers of Samples As noted, another important feature of the photoactivation devices of the present invention is that they provide for the processing of large numbers of samples. In this regard, one element of the devices of the present invention is a means for supporting a plurality of sample vessels. In the preferred embodiment of the present invention the supporting means comprises a sample rack detachably coupled to the housing of the device. The sample rack provides a means for positioning the plurality of sample vessels. The positioning means has been designed to be useful in combination with commonly used laboratory sample vessels. Commonly used laboratory sample vessels include, but are not limited to, test tubes, flasks, and small volume (0.5 - 1.5 ml) plastic tubes (such as Eppendorph tubes) . By accepting commonly used laboratory sample vessels, the sample rack of the preferred embodiment of the present invention allows for convenient processing of large numbers of samples. The detachable aspect of the sample rack in the preferred embodiment also provides for interchange- ability of the supporting means. Sample racks having different features suited to different size sample vessels and/or different size photoactivation jobs can be interchanged freely. The embodiments of the device of the present invention also provide for the processing of a large liquid sample. In the preferred embodiment of the device of the present invention, a trough is provided for holding temperature control liquid (see next section) . In an alternative embodiment, it is contemplated that the trough serve as a built-in container for liquid that is to be irradiated. In such a case, the device of the present invention provides a flow-through trough, having inlet and outlet ports for liquid. It is contemplated that the flow-through trough serve as a container for continuous liquid flow during irradiation. Temperature control of this flow-through system can still be achieved by use of an external temperature control means (e.g. a temperature controlled reservoir) . D. Temperature Control As noted, one of the important features of the photoactivation devices of the present invention is temperature control. Temperature control is important because the temperature of the sample in the sample vessel at the time of exposure to light can dramatically impact the results. For example, conditions that promote secondary structure in nucleic acids also enhance the affinity constants of many psoralen derivatives for nucleic acids. Hyde and Hearst, Biochemistry, 17, 1251 (1978). These conditions are a mix of both solvent composition and temperature. With single stranded 5S ribosomal RNA, irradiation at low temperatures enhances the covalent addition of HMT to 5S rRNA by two fold at 4°C compared to 20°C. Thompson et _l. , J. Mol. Biol. 147:417 (1981). Even further temperature induced enhancements of psoralen binding have been reported with synthetic polynucleotides. Thompson et al.. Biochemistry 21:1363 (1982). Temperature control is also an important factor for hybridization assays that detect allele specific nucleic acid targets. Allelic variants of a specific target nucleic acid may differ by a single base. Sickle cell anemia is an example of a human genetic disease that results from the change of a single base (A to T) in the gene for the human β globin molecule. The specific hybridization of a single oligonucleotide probe to one of two allelic variants that differ by only a single base requires very precise temperature control. Wood et al. , Proc. Nat. Acad. Sci. 82:1585 (1985). The irradiation of psoralen monoadducted oligonucleotide probes under hybridization equilibrium conditions results in the covalent attachment of these probes to their targets. Allele specific discrimination of a single base change is possible with these crosslinkable probes. However, discrimination is sharply dependant upon temperature. A 2°C change during the irradiation procedure will have dramatic effect on the level of discrimination that is observed. Because temperature control extends to maintaining temperatures important for particular reactions, it is contemplated that the temperature maintaining means of the present invention is capable of maintaining a desired sample vessel temperature which is substantially different than room temperature. For example, the desired sample vessel temperature may be below ambient temperature. 5. Inherent Safety Ultraviolet radiation can cause severe burns. Depending on the nature of the exposure, it may also be carcinogenic. The light source of a preferred embodiment of the present invention is shielded from the user. This is in contrast to the commercial hand-held ultraviolet sources as well as the large, high intensity sources. In a preferred embodiment, the irradiation source is contained within a housing made of material that obstructs the transmission of radiant energy (i.e. an opaque housing) . As noted above, sample vessels are placed in the sample rack which is detachably coupled to the housing above the rack. As a final precaution, a sample overlay is provided that extends over and covers the sample vessels. This sample overlay provides two functions. First, it helps to maintain the position of the sample vessels when liquid is in the trough. Second, and more importantly, it closes off the only opening of the housing and, thereby, seals the device. The sealed device allows no irradiation to pass to the user. This allows for inherent safety for the user. It is not intended that the device and method of the present invention be limited by the particular irradiation need. However, a preferred use of the device of the present invention is for photoactivation of activation compounds. "Activation compounds" defines a family of compounds that undergo chemical change in response to triggering stimuli. Triggering stimuli include, but are not limited to, thermal stimuli, chemical stimuli and electromagnetic stimuli. "Photoreactive, activation compounds" (or simply "photoreactive compounds") , defines a genus of compounds in the activation compound family that undergo chemical change in response to electromagnetic radiation. Examples of photoreactive compounds are provided in Table 1. Thiaxanthenones Where photoactivation is desired, it is not intended that the present invention be limited to any one type of photoreactive compound. One species of photoreactive compounds that is preferred, however, is furocoumarins. C* + NA → NA:C The product of this reaction is hereinafter referred to as "Photoaddition Product" and is to be distinguished from "Photoproduct." "photoproduct" does not depend on which one (if any) of these reactions actually occurs. "Photoproduct" - whatever its nature - is deemed to exist if, following the reaction of a compound and activating wavelengths of electromagnetic radiation, there is a resultant product formed that is later capable of binding to nucleic acid in the absence of electromagnetic radiation, i.e. capable of dark binding (whether non-covalent dark binding or covalent dark binding) . Aminomethyl-4,5,-dimethylisopsoralen (AMDMIP) are exposed to activating wavelengths of electromagnetic radiation (particularly when irradiated with the CE- III device) . The major resultant products of HMT are two cyclobutyl photodimers. In one of the dimers. the two pyrone rings are linked in a cis-syn configuration, while in the other dimer, the linkage occurs between the furan end of one molecule and the pyrone end of the other, again with cis-syn configuration. A third resultant product of HMT is a monomeric HMT photoisomer. In this isomer, the central ring oxygens assume a 1, 4 instead of the normal 1, 3 orientation. While the two photodimers would not be expected to have an intercalating activity due to geometrical considerations, the photoisomer remains planer, and accordingly, it is contemplated that it has a positive intercalative association with double stranded nucleic acid. Analogously, it is contemplated that some of the resultant products of AMIP and AMDMIP also have a positive intercalative association with nucleic acid. While not limited to any particular theory, non- covalent dark binding is anticipated where monomeric isomers are formed, and particularly, where the positively charge aminomethyl moiety is retained in the structure. Photobinding Where photoactivation is performed with the device of the present invention, photobinding may occur. "Photobinding", as noted above, is defined as the binding of photobinding compounds in the presence of photoactivating wavelengths of light. Photobinding compounds are compounds that bind to nucleic acid in the presence of photoactivating wavelengths of light. It is not intended that the device of the present invention be limited to any particular type of photobinding procedure. The present invention contemplates a number of photobinding procedures, including 1) photobinding with photobinding compounds, 2) high photobinding with new and known compounds, and 3) photobinding to label nucleic acids. EXPERIMENTAL The following examples serve to illustrate certain preferred embodiments and aspects of the present invention and are not to be construed as limiting the scope thereof. Chemical Co., Rockford, IL) ; Polycast (Polycast Technology Corp., Stamford, CT) ; Rohm and Haas (Rohm and Hass Co., Los Angeles, CA) ; Sigma (Sigma Chemical Co. , St. Louis, MO) ; Spectrum (Spectrum Medical Industries, Los Angeles, CA) . To better characterize the devices of the present invention, a customized light instrument (hereinafter referred to as "the PTI device") was constructed from commerically available parts (at a cost of approximately $10,000.00) to serve as a control. The device is a modified version of a described device. G.D. Cimino et al. , Biochemistry 25, 3013 (1986) . Some machining was necessary to retrofit some of the commercial parts and to make specialized adapters and holders. A 500 watt Hg/Xe arc lamp (Model A5000, Photon Technology International) positioned at the focal point of an elliptical mirror in a commercial lamp housing provides the light for the PTI device. The output from the lamp housing passes into an adaptor tube which provides physical support for additional optical accessories and prevents harmful stray UV radiation from emanating into the lab. A mirror deflects the optical beam in the adaptor tube so that it passes through the other optical components. Two water-cooled, liquid filters are used. Concentrations for photoproduct are given in terms of the amount of unirradiated starting material, where subsequent irradiation is performed in the absence of nucleic acid. For example, if 50 μg/ml of unirradiated starting material is subsequently irradiated in the absence of DNA, the concentration of resulting photoproduct is given as 50 μg/ml. The starting compound (unirradiated compound) for photoproduct is sometimes indicated when photoproduct is referred to. For example, the photoproduct produced following irradiation of AMDMIP is referred to as AMDMIP photoproduct. Where polyacrylamide gel electrophoresis (PAGE) is used, denaturing (7 or 8 M urea) polyacrylamide gels (28cm x 35cm x 0.4mm) were poured and pre- electrophoresed for 30 to 60 minutes at 2000 Volts, 50 Watts, 25 milliamps. 12% gels were used for oligonucleotides between 40 and 200 base pairs in length; 8% gels were used for longer sequences. Depending on the length of DNA to be analyzed, samples were loaded in either 8M urea, containing 0.025% tracking dyes (bromphenol blue and xylene cyanol) , or in 80% formamide, 10% glycerol, 0.025% tracking dyes, then electrophoresed for 2-4 hours at 2000 Volts, 50 Watts, 25 milliamps. Following PAGE, individual bands were, in most cases, visualized by autoradiography. Autoradiography involved exposure overnight at -70°C to Kodak XAR-5 films with an intensifying screen. In some cases, the visualized bands were cut from the gel and collected for scintillation counting. Scintillation counting involved the use of a scintillation fluid and a commercial scintillation counter (Searle Analytic 92, Model ≠ 000 006893) . EXAMPLE 1 Photoactivation Device One embodiment of the device of the present invention is designated "CE-I." CE-I is an irradiation device having the following features: 1) an inexpensive source of electromagnetic radiation, 2) temperature control of the sample, 3) a multisample holder, 4) a multiple sample irradiation format, and 5) a compact design that requires minimal bench space. Figure 1 is a perspective view of CE-I, integrating the above-named features. The figure shows the bottom platform of a housing (100) with the rest of the housing removed (not shown) , having six bulbs (101-106) connectable to a power source (not shown) arranged around a chamber (107) having a plurality of intrusions (108) for supporting a plurality of sample vessels (109) . The bulbs serve as a source of electromagnetic radiation and, in one embodiment, ultraviolet radiation. While not limited to the particular bulb type, the embodiment is configured to accept an industry standard, F8T5BL hot cathode dual bipin lamp. The chamber (107) , in addition to holding sample vessels (109) , holds temperature control liquid (not shown) , thereby serving as a means for controlling the temperature of the sample vessels (109) . Figure 2 is a cross-sectional view of CE-I along the lines of a—a of Figure 1. Figure 2 shows the arrangement of the sources (101-106) around the chamber (107). Figure 2 also shows the chamber (107) is punctuated with sample holder intrusions (108) with dimensions designed to accommodate the sample vessels (109) . It is not intended that the present invention be limited by the nature of the material used to form the chamber (107) . In one embodiment, it is made of glass. In another embodiment, it is made of plastic. In a preferred embodiment, it is made of UV transmitting acrylic selected from the group of commercial acrylics consisting of ACRYLIC-UVT (Polycast) , PLEXIGLAS 11-UVT (Rohm & Haas) , PLEXIGLAS G-UVT (Rohm & Haas) and ACRYLITE 0P-4 (Cyro) . Similarly, it is not intended that the present invention be limited by the nature of the method used to form the chamber (107) . In one embodiment, it is molded as one piece. In another embodiment, it is molded as separate pieces and then assembled. Figure 1 shows that the temperature control liquid is introduced via a liquid inlet port (111) and removed via a liquid outlet port (112) . It is preferred that the liquid inlet port (111) and the liquid outlet port (112) connect via tubes (113, 114) to a liquid source (not shown) . It is further preferred that the liquid source allow for recirculation of the liquid. To improve temperature control, static temperature control liquid (not shown) may be placed in the intrusions (108) . It is not intended that the present invention be limited to any particular temperature control liquid. One inexpensive temperature control liquid contemplated by the invention is water. Figure 3 shows the CE-I embodiment with seven intrusions (108) placed within the boundary defined by the inlet (111) and outlet (112) ports. While the number of intrusions (108) and their placement may be selected to suit the convenience of the user, some configurations may impact irradiation efficiency. Figures 1 and 2 also show an array of reflectors (115, 116, 117) . It is preferred that the reflectors are made from UV reflecting metal. While not limited to any particular dimensions (the drawings are not drawn to scale) , it is preferred that the intrusions (108) be approximately 4 cm deep, that the intrusions be spaced approximately 3 cm apart, and the the distance from the top surface of the housing to the opening of the intrusions be approximately 6.5 cm. In such an arrangment, the lower bulbs (103, 104) are preferrably 2.3 cm apart when measured from their centers (their centers are preferrably 1.2 cm above the housing when measured from the surface of the reflector 117). This allows the lower bulbs (103, 104) to be less than 1.5 cm in distance from the bottom of the reaction vessel (109) . The other bulbs can be viewed as two more sets (101, 102 and 105, 106) (for a total of three, two bulb sets in all) . Within a set, it is preferred that the bulbs are 2.3 cm apart when measuring from their centers (their centers are preferrably 1.2 cm away from the the surface of the reflectors 115, 116) . It is preferred that the reflectors 115 and 116 are approximately 11 cm apart when measuring from their sides. RL > BL > CL Preferred lengths are RL - 29.5 cm, BL = between 26 cm and 29 cm, and CL = approximately 25 cm. (208) for supporting a plurality of sample vessels (not shown) . (210) permits a user to preset the irradiation time to a desired level of sample exposure. The hour meter (211) maintains a record of the total number of radiation hours that are provided by the source of electromagnetic radiation. This feature permits the bulbs (201-206) to be monitored and changed before their output diminishes below a minimum level necessary for rapid photoactivation. The chamber (207) , in addition to holding sample vessels, holds temperature control liquid (not shown) , thereby serving as a means for controlling the temperature of the sample vessels. It is not intended that the present invention be limited by the nature of the material used to form the chamber (207) . In one embodiment, it is made of glass. In another embodiment, it is made of plastic. In a preferred embodiment, it is made of UV transmitting acrylic selected from the group of commercial acrylics consisting of ACRYLIC-UVT (Polycast) , PLEXIGLAS 11-UVT (Rohm & Haas) , PLEXIGLAS G-UVT (Rohm & Haas) and ACRYLITE OP-4 (Cyro) . Similarly, it is not intended that the present invention be limited by the nature of the method used to form the chamber (207) . In one embodiment, it is molded as one piece. In another embodiment it is molded in separate pieces and then assembled. Figure 4 shows that the temperature control liquid is introduced via tubes (212, 212) from a liquid source (not shown) and is circulated via liquid inlet and outlet ports (not shown) . It is not intended that the present invention be limited to any particular temperature control liquid. One inexpensive temperature control liquid contemplated by the invention is water. Figure 5 shows the positioning of reflectors (214,215). It is preferred that the reflectors be made from UV reflecting metal. (212, 213). While the number of intrusions (208) and their placement may be selected to suit the convenience of the user, there can be a significant impact on irradiation efficiency. In this embodiment, the intrusions (208) were aligned in two rows with the intrusion (208) of one row lined up opposite the intrusion (208) of the other row. Performance data obtained subsequent to the design indicated that this arrangement of intrusions (208) may cause the electromagnetic radiation to be partially blocked, i.e. the intrusion (208) of one row is blocking electromagnetic radiation coming from one side of the device so that the intrusion (208) opposite from it in the other row receives less electromagnetic radiation. Figure 5 shows the "V-shape" geometry of the bulb (201-206) placement of this embodiment in relation to the chamber (207) . The V-shape geometry is, in large part, dictated by the dimension demands placed on the chamber (207) by virtue of the double row arrangment of the intrusions (208) . The distance from the center of one intrusion (208) in one row and to the center of the opposite intrusion (208) in the other row is greater than 5.5 cm. This causes the upper level bulbs (201, 206) to be placed almost 13.5 cm apart (measured center to center) , the middle level bulbs (202, 205) to be placed almost 11.5 cm apart (measured center to center) , and the lower level bulbs (203, 204) to be placed almost 4.0 cm apart (measured center to center) . In this embodimnt, CL = approximately 37 cm. EXAMPLE 32 Photoactivation Device A preferred embodiment of the photoactivation device of the present invention is designated "CE- III." CE-III is an irradiation device created to optimize rapid photoactivation having the following features: 1) an inexpensive source of electromagnetic radiation, 2) temperature control of the sample, 3) control of irradiation time, 4) a multisample holder, 5) a multiple sample irradiation format, 6) a housing that shields the user from stray electromagnetic radiation, and 7) a compact design that requires minimal bench space. Figures 6, 7 and 8 are views of CE-III, integrating the above-named features, showing a housing (300) containing eight bulbs (301-308) connectable to a power source (not shown) arranged around a detachable chamber (309) , having interior (310) and exterior walls (311) . The interior walls (310) form a trough (312) . Figures 6 and 8 show one embodiment of an interchangeable, detachable sample rack (313A) . The sample rack (313A) is detachably coupled to the housing (300) above the trough (312) . Sample vessels (315) fit in the sample rack (313A) and are thereby aligned in the trough (312) . A sample overlay (314) extends over and covers the interchangeable sample rack (313A) sealing the unit and shielding the user from electromagnetic radiation when the device is in operation. Figure 9 shows an alternative embodiment of an interchangeable, detachable sample rack (313B) . Note that in this embodiment, the placement of sample vessels (315) in two rows is staggered to avoid blocking electromagnetic radiation (compare with CE- II, above) . Figure 7 shows a unitary reflector (316) extending around all the bulbs (301-308) of the device. It is preferred that the reflector (316) is made of UV reflecting material. The chamber (309) holds circulating temperature control liquid (317) between the interior (310) and exterior walls (311) , thereby serving as a means for controlling the temperature of the sample vessels (315) . Figure 8 shows that the circulating temperature control liquid (317) is introduced from a liquid source (not shown) via a liquid inlet port (318) and removed via a liquid outlet port (319) , allowing for recirculation of the liquid. To improve temperature control, static temperature control liquid (not shown) may be placed in the trough. It is not intended that the present invention be limited to any particular temperature control liquid. One inexpensive temperature control liquid contemplated by the invention is water. (321) provides power to a count down timer (322) . The count down timer (322) in turn controls the current to an hour meter (323) and to the coils (not shown) of the source of electromagnetic radiation. The count down timer (322) permits a user to preset the irradiation time to a desired level of sample exposure. The hour meter (323) maintains a record of the total number of radiation hours that are provided by the source of electromagnetic radiation. This feature permits the bulbs (301-308) to be monitored and changed before the output diminishes below a level necessary to achieve rapid photoactivation. In the "OFF" position, timer activation switch (321) is wired such that it bypasses the count down timer (322) and provides continual power to the hour meter (323) and the coils (not shown) of the source of electromagnetic radiation. Figure 7 shows the "U-shape" geometry of the bulb (301-308) placement of this embodiment in relation to the chamber (309) . (Compare with the V- shape geometry of CE-II.) The U-shape geometry is, in large part, allowed by the smaller dimensions of the chamber (207) by virtue of the trough (312) design. While not limited by the particular dimensions, the width of the trough (312) , when measured by the length of the bottom exterior wall (311) is 6 cm. The upper level bulbs (301, 308) are placed less than 9 cm apart (measured center to center) . Again, it is preferred that the chamber (309) length ("CL") , the bulb (301-308) length ("BL") and the reflector (317) length ("RL") follow the relation ship: RL > BL > CL. EXAMPLE 33 Photoactivation Device: Temperature Control Temperature changes can have a drastic impact on photoactivation chemistry. It is desired that the devices of the present invention provide temperature control to limit the possibility of uncontrolled changes on photoactivation results. Figure 10 illustrates the problem of lack of temperature control for the devices of the present invention. CE-I, CE-III and the PTI device were allowed to irradiate 1.5 ml Eppendorph tubes without using the means for controlling the temperature of the sample vessels of the present invention. The temperature of the temperature control liquid was measured over time. Measurements were conducted with a type T thermocouple immersed into a 0.5 ml Eppendorph tube containing 100 μl of dH20. The Eppendorph tube was irradiated in each device. For irradiations with the PTI device, the tube was irradiated from the top down, with the cap closed. Temperature was monitored on an Omega Temperature Controller, Model 148 (Omega Engineering, Inc. , Stamford, CT) . The results (Figure 10A) show that the temperature of the sample vessel rapidly increases in temperature without temperature control. By contrast, irradiations with temperature control (Figure 10B) show a constant temperature. EXAMPLE 34 Photoactivation Device: Energy Output This example investigates energy output as it relates to optimum photobinding kinetics. Figure 11 shows the relative energy output of the devices of the present invention. The PTI device has a tremendously strong intensity relative to CE-III. From the relative intensity output it would appear that the fluorescent source of ultraviolet irradiation is not of sufficient flux for rapid photoactivation. At the very least, a dramatic difference in kinetics of photobinding was expected for the two machines. The impact of this difference on binding was investigated as shown in Figure 12. 3H-HMT was used to measure binding to calf thymus DNA. 3H-HMT was mixed with the DNA and irradiated. The product was then extracted with chloroform to separate the unbound 3H-HMT. The nucleic acid was then precipitated and solubilized. Bound HMT was determined by scintillation counting along with measuring the optical density of the DNA solution. The results are shown in Figure 13. Surprisingly, the kinetics of the CE-III device are essentially the same as the costly PTI device. Plateau binding for the CE-III and PTI machines was reached in less than five minutes. Interestingly, CE-II did not reach plateau binding under the conditions of the experiment. (Plateau binding might be reached with the CE-II device in one of two ways: 1) additional radiation time, or 2) use of a sample vessel with better UV transmission properties such as a polycarbonate tube) . The impact of the small differences in position of samples within the photoactivation device was investigated. Figure 14 shows the intensity of the light of CE-III at the surface of the trough (Figure 7, element 312) according to sample position. Samples from the center position and the end position of the sample rack (Figure 6, element 313A) were examined for photobinding in the manner outlined in Figure 12. The results are shown in Figure 15. It is clear that some difference in photoaddition kinetics exists when the irradiation time is below two minutes. This illustrates the importance of plateau binding to nullify such small positional differences (contrast Figure 15 with Figure 13). Photoactivation Device: Photoproduct In the first part of this example, the various embodiments of the photoactivation device of the present invention were investigated for their ability to create photoproduct. In the second part, photoproduct is shown to bind to nucleic acid. Figure 16 shows schematically the manner in which photoproduct generation was investigated. Figure 17 shows the production of photoproduct over time on the CE-III device for known compound AMDMIP. While the AMDMIP standard (unirradiated compound) shows a single peak on HPLC (Figure 17A) , AMDMIP photoproduct peaks increase and the AMDMIP peak diminishes from two minutes (Figure 17B) , five minutes (Figure 17C) and fifteen minutes (Figure 17D) . Figure 18 shows production of photoproduct according to the photoactivation device used for known compound AMDMIP. Again the AMDMIP standard is a single peak on HPLC (Figure 18A) . By contrast, the fifteen minute irradiation with CE-III shows increase in photoproduct peaks and a decrease in the AMDMIP peak (Figure 18, compare A to B and note scale change) . Irradiation for the same time period, however, on the PTI device shows very little reduction in the AMDMIP peak and very little generation of photoproduct peaks (Figure 18, compare A to C and note scale change) . Clearly, the CE-III device generates more AMDMIP photoproduct than does the PTI device. association is shown in Table 2 to depend upon the reaction conditions. Binding is influenced by the photoactivation device used. When 3H-AMDMIP irradiated with the CE- III device is compared with 3H-AMDMIP irradiated with the PTI device, a significantly greater amount of associated counts is observed. This can be viewed as consistent with the observation (Figure 18) that more photoproduct is made with CE-III than with the PTI device after the same exposure time. Interestingly, thermal cycling results in a five fold higher association than a 2 hour reaction at room temperature (regardless of the device used) . As seen by the results with no irradiation, the isolation procedure that was applied to the DNA samples to remove unbound reactants removes most of the non-covalently associated reactants. The increase in counts seen when irradiated AMDMIP reacts with DNA, relative to those counts seen when unirradiated AMDMIP is reacted, is therefore presumed to be due to covalent association of photoproduct with DNA. That is not to say, however, that the counts must be due to covalent interactions. It is possible that photoproduct has a very high non-covalent association with nucleic acid. This association may be high enough that photoproduct is non-covalently associated with DNA even after the rigorous work up. From the above, it is clear that the device and method of the present invention offers advantages over the specialized instruments of researchers as. well as many of the commercially available irradiation devices. 1. A device, comprising: a) means for providing electromagnetic radiation; b) means for supporting a plurality of sample vessels in a fixed relationship with said radiation providing means during irradiation; c) an opaque housing for containing said radiation providing means; and d) means for maintaining the temperature of said sample vessels within a desired temperature range during said irradiation comprising a chamber positioned interior to said housing and in a fixed relationship to said radiation providing means. 2. A device as in Claim 1, wherein said sample vessel supporting means comprises intrusions in said chamber. 3. A device as in Claim 1, wherein said chamber has exterior and interior walls. 4. A device as in Claim 1, wherein said interior walls of said chamber form a trough. 5. A device as in Claim 4 wherein said sample vessel supporting means comprises a sample rack detachably coupled to said housing above said trough. 14. A device as in Claims 8, 9, 10, 11, 12 or 13, wherein said chamber has inlet and outlet ports so that temperature control liquid may enter and exit. 15. A device, comprising: a) a fluorescent source of ultraviolet radiation; b) means for supporting a plurality of sample vessels in a fixed relationship with said fluorescent radiation source during irradiation; and c) means for maintaining the temperature of said sample vessels within a desired temperature range during said irradiation, comprising a chamber positioned in fixed relationship to said fluorescent radiation source. 16. A device as in Claim 15, wherein said sample vessel supporting means comprises intrusions in said chamber. 17. A device as in Claim 15, wherein said chamber has exterior and interior walls. 18. A device as in Claim 17, wherein said interior walls of said chamber form a trough. 19. A device as in Claim 18, wherein said sample vessel supporting means comprises a sample rack detachably coupled to said housing above said trough. 7. A device as in Claims 1, 2, 3, 4, 5 or 6 wherein said chamber has inlet and outlet ports so that temperature control liquid may enter and exit. 8. A device, comprising: a) means for providing electromagnetic radiation, having a wavelength cutoff at 300 nanometers; b) means for supporting a plurality of sample vessels in a fixed relationship with said radiation providing means during irradiation; and c) means for maintaining the temperature of said sample vessels within a desired temperature range during said irradiation, comprising a chamber positioned in a fixed relationship to said radiation providing means. 9. A device as in Claim 8, wherein said sample vessel supporting means comprises intrusions in said chamber. 10. A device as in Claim 8, wherein said chamber has exterior and interior walls. 11. A device as in Claim 10, wherein said interior walls of said chamber form a trough. 12. A device as in Claim 11, wherein said sample vessel supporting means comprises a sample rack detachably coupled to said housing above said trough. 13. A device as in Claim 12, further comprising a sample cover dimensioned to overlay said sample rack. 21. A device as in Claims 15, 16, 17, 18, 19 or 20, wherein said chamber has inlet and outlet ports so that temperature control liquid may enter and exit. 22. A device, comprising: a) a fluorescent source of ultraviolet radiation; b) means for supporting a plurality of sample vessels, said sample supporting means positioned with respect to said fluorescent source, so that, when measured for the wavelengths between 300 and 400 nanometers, an intensity flux greater than 15 mW cm"2 is provided to said sample vessels during irradiation with said fluorescent source; c) an opaque housing for containing said radiation providing means; and d) means for maintaining the temperature of said sample vessels within a desired temperature range during said activation, comprising a chamber positioned interior to said housing and in a fixed relationship to said fluorescent radiation source. 23. A device as in Claim 22, wherein said sample vessel supporting means comprises intrusions in said chamber. 24. A device as in Claim 22, wherein said chamber has exterior and interior walls. 25. A device as in Claim 24, wherein said interior walls of said chamber form a trough. 26. A device as in Claim 25, wherein said sample vessel supporting means comprises a sample rack detachably coupled to said housing above said trough. 27. A device as in Claim 26, further comprising a sample overlay dimensioned to extend over and cover said sample rack. 28. A device as in Claims 22, 23, 24, 25, 26 or 27, wherein said chamber has inlet and outlet ports so that temperature control liquid may enter and exit. 29. A photoactivation device for treating photoreactive compounds, comprising: a) means for continuously flowing sample liquid containing photoreactive compound; b) means for providing appropriate wavelengths of electromagnetic radiation in a fixed relationship with said continuous flowing means to cause activation of at least one photoreactive compound; and c) means for maintaining the temperature of said continuously flowing sample liquid within a desired temperature range during said activation. 30. A method for photoactivating photoreactive compounds, comprising: a) supporting a plurality of sample vessels, containing one or more photoreactive compounds, in a fixed relationship with a fluorescent source of electromagnetic radiation; b) irradiating said plurality of sample vessels simultaneously with said electromagnetic radiation to cause activation of at least one photoreactive compound; and c) maintaining the temperature of said sample vessels within a desired temperature range during said activation. ES2215230T3 (en) 2004-10-01 System and method to perform and monitor polymerase chain reactions.